Located on its private peninsula with views of the Ionian Sea, the Corfu Imperial, Grecotel Exclusive Resort boasts 3 private sandy beaches and a large outdoor pool. All rooms at this hotel enjoy a excellent sea view whether in the main building or in a bungalow in the gardens that lead down to the sea. Corfu Imperial dining combines exclusive waterfront settings and award-winning chefs. Gourmet restaurant Aristos offers à la carte Greek and Mediterranean dishes. Guests can enjoy an after-dinner drink in the lounge bar, the cocktail bar and the pool bar. 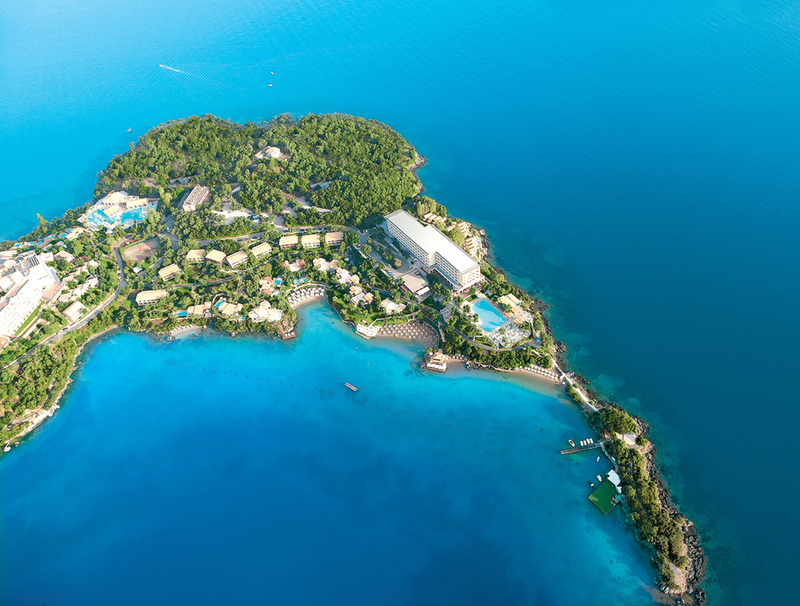 Previously a favoured retreat for royalty, this island hideaway provides the perfect setting for spa treatments. Shopping opportunities include a jewellery shop, clothes boutique and a hairdresser. The hotel's entertainment team offers a variety of activities from morning gym, aerobics and beach games to dancing lessons, evening shows and musical nights from the rich tradition of the island. Corfu Town is located 9 km away. Located in the picturesque Kontokali peninsula, the green-key awarded Kontokali Bay Resort & Spa boasts its own private beach and a sea-water pool. It features a tennis court, 4 restaurants and rooms with free Wi-Fi access. The rooms and bungalows are set amidst beautiful gardens. Each offers balcony or terrace with view of the garden or the sea. The spa centre offers an indoor heated pool, hammam, hot tub, 2 saunas and a steam room. Massages, aromatherapy and anti-ageing treatments are also available.. A kids' pool is also available. Dining options at Kontokali Bay include a beach-side restaurant, a beach tavern serving fish specialties and a buffet-style restaurant. The hotel also has a lobby/piano bar and a beach bar. Kontokali Bay Resort is located just 6 km from Corfu town, port and airport. At Cavalieri Hotel you will experience living in a historic building while enjoying all the amenities of a 21st century accommodation. Originally a 17th century nobleman's mansion, Cavalieri offers a rooftop terrace with fantastic views of Corfu Town and the fortress, stretching out to the sea and to the mountains of Albania. The year-round hotel is located in the centre of Corfu, an ideal location for dining, shopping and sightseeing and a short walk from the beach and museums. Enclosed by rich greenery in the Kanoni peninsula, just 3 km from the centre of Corfu Town, 4-star Divani Palace has wonderful swimming pool with hot tub. Breakfast is served on a balcony overlooking the bay. The tastefully decorated rooms come with Ionian Sea and garden views with some rooms also have a separate lounge area. The main restaurant serves Greek and international cuisine during lunch and dinner. The Laguna Pool Restaurant is great for snacks or drinks and has stunning sunset views. A children’s pool and a playground are available and a well-equipped fitness centre is also provided. Corfu International Airport is 2 km away and lovely Palaiokastritsa is at 25 km. 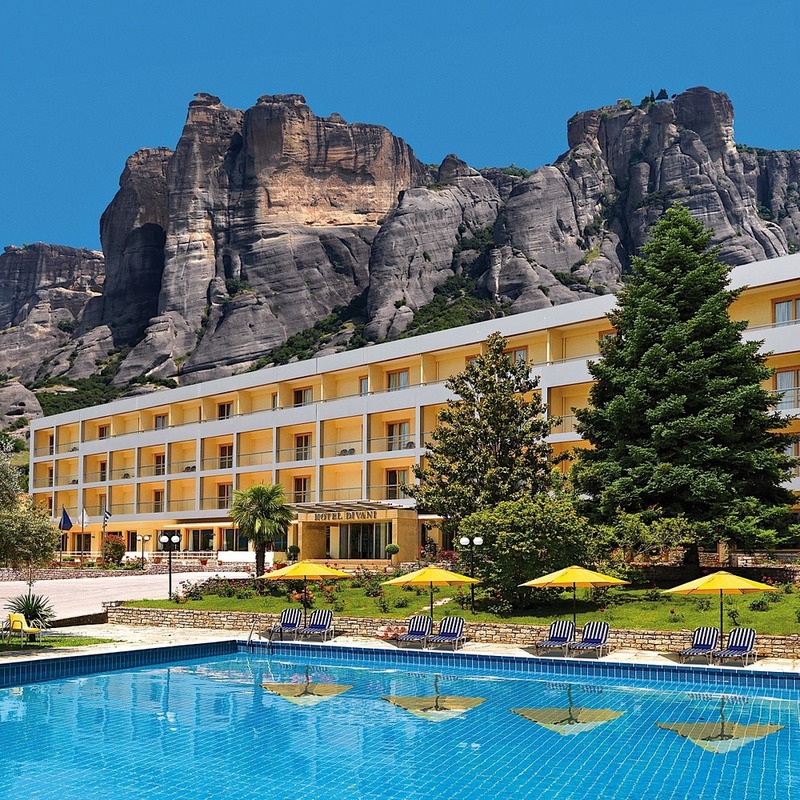 The 3 star hotel inPotamaki Beach is situated in the center of Benitses village, by the sea. It is a modern 5 storey building with nice and comfortable public areas. Guests can enjoy the fresh-water swimming pool with large pool terrace equipped with umbrellas, sun beds and showers. Also available is a pool for children.